Aortic stenosis is the obstruction of blood flow across the aortic valve (see the image below). Among symptomatic patients with medically treated moderate-to-severe aortic stenosis, mortality from the onset of symptoms is approximately 25% at 1 year and 50% at 2 years. Symptoms of aortic stenosis usually develop gradually after an asymptomatic latent period of 10-20 years. Stenotic aortic valve (macroscopic appearance). Systolic hypertension can coexist with aortic stenosis. However, a systolic blood pressure higher than 200 mm Hg is rare in patients with critical aortic stenosis. In severe aortic stenosis, the carotid arterial pulse typically has a delayed and plateaued peak, decreased amplitude, and gradual downslope (pulsus parvus et tardus). The only definitive treatment for aortic stenosis in adults is aortic valve replacement (surgical or percutaneous). The development of symptoms due to this condition provides a clear indication for replacement. [3, 4] Infants, children, and adolescents with a bicuspid valve may undergo balloon or surgical valvotomy. Percutaneous balloon valvuloplasty is used as a palliative measure in critically ill adult patients who are not surgical candidates or as a bridge to aortic valve replacement in critically ill patients. Aortic stenosis is the obstruction of blood flow across the aortic valve. Aortic stenosis has several etiologies, including congenital (unicuspid or bicuspid valve), calcific (due to degenerative changes), and rheumatic. Degenerative calcific aortic stenosis is now the leading indication for aortic valve replacement. The favorable long-term outcome following aortic valve surgery and the relatively low operative risk emphasize the importance of an accurate and timely diagnosis (see Prognosis). A stenotic valve is shown in the image above. Symptoms of aortic stenosis usually develop gradually after an asymptomatic latent period of 10-20 years. Exertional dyspnea or fatigue is the most common initial complaint. Ultimately, most patients experience the classic triad of chest pain, heart failure, and syncope (see History). Two-dimensional (2D) Doppler echocardiography is the imaging modality of choice to diagnose and estimate the severity of aortic stenosis and localize the level of obstruction (see Workup). The only definitive treatment for aortic stenosis is aortic valve replacement, either surgically or percutaneously. (see Treatment). Go to Pediatric Valvar Aortic Stenosis, Pediatric Subvalvar Aortic Stenosis, and Pediatric Supravalvar Aortic Stenosis for more complete information on these topics. When the aortic valve becomes stenotic, resistance to systolic ejection occurs and a systolic pressure gradient develops between the left ventricle and the aorta. This outflow obstruction leads to an increase in left ventricular (LV) systolic pressure. As a compensatory mechanism to normalize LV wall stress, LV wall thickness increases by parallel replication of sarcomeres, producing concentric hypertrophy. At this stage, the chamber is not dilated and ventricular function is preserved, although diastolic compliance is reduced. Eventually, however, LV end-diastolic pressure (LVEDP) rises, which causes a corresponding increase in pulmonary capillary arterial pressures and a decrease in cardiac output due to diastolic dysfunction. The contractility of the myocardium may also diminish, which leads to a decrease in cardiac output due to systolic dysfunction. Ultimately, heart failure develops. In most patients with aortic stenosis, LV systolic function is preserved and cardiac output is maintained for many years despite an elevated LV systolic pressure. Although cardiac output is normal at rest, it often fails to increase appropriately during exercise, which may result in exercise-induced symptoms. Diastolic dysfunction may occur as a consequence of impaired LV relaxation and/or decreased LV compliance, as a result of increased afterload, LV hypertrophy, or myocardial ischemia. LV hypertrophy often regresses following relief of valvular obstruction. However, some individuals develop extensive myocardial fibrosis, which may not resolve despite regression of hypertrophy. In patients with severe aortic stenosis, atrial contraction plays a particularly important role in diastolic filling of the LV. Thus, development of atrial fibrillation in aortic stenosis often leads to heart failure due to an inability to maintain cardiac output. Increased LV mass, increased LV systolic pressure, and prolongation of the systolic ejection phase all elevate the myocardial oxygen requirement, especially in the subendocardial region. Although coronary blood flow may be normal when corrected for LV mass, coronary flow reserve is often reduced. Myocardial perfusion is thus compromised by the relative decline in myocardial capillary density and by a reduced diastolic transmyocardial (coronary) perfusion gradient due to elevated LV diastolic pressure. Therefore, the subendocardium is susceptible to underperfusion, which results in myocardial ischemia. Angina results from a concomitant increased oxygen requirement by the hypertrophic myocardium and diminished oxygen delivery secondary to diminished coronary flow reserve, decreased diastolic perfusion pressure, and relative subendocardial myocardial ischemia. There may exist a causal association between LDL-C-related genetic variants and aortic valve disease. In a community-based study consisting of 6942 subjects with data on aortic valve calcium and more than 28,000 subjects with aortic stenosis (follow-up, >16 y), Smith et al found that genetic predisposition toward elevations in low-density lipoprotein cholesterol (LDL-C) (as indicated by genetic risk scores [GRSs])—but not elevated high-density lipoprotein cholesterol (HDL-C) or triglycerides GRSs—were associated with the presence of aortic valve calcium and the incidence of aortic stenosis. Whether early intervention aimed at reducing LDL-C levels may help to prevent aortic valve disease is unknown. Most cases of aortic stenosis are due to the obstruction at the valvular level. Common causes are summarized in Table 1. Valvular aortic stenosis can be either congenital or acquired. Congenitally unicuspid, bicuspid, tricuspid, or even quadricuspid valves may cause aortic stenosis. 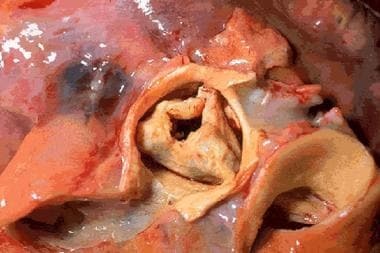 In neonates and infants younger than 1 year, a unicuspid valve can produce severe obstruction and is the most common anomaly in infants with fatal valvular aortic stenosis. In patients younger than 15 years, unicuspid valves are most frequent in cases of symptomatic aortic stenosis. In adults who develop symptoms from congenital aortic stenosis, the problem is usually a bicuspid valve. Bicuspid valves do not cause significant narrowing of the aortic orifice during childhood. The altered architecture of the bicuspid aortic valve induces turbulent flow with continuous trauma to the leaflets, ultimately resulting in fibrosis, increased rigidity and calcification of the leaflets, and narrowing of the aortic orifice in adulthood. Congenitally malformed tricuspid aortic valves with unequally sized cusps and commissural fusion (“functionally bicuspid” valves) can also cause turbulent flow leading to fibrosis and, ultimately, to calcification and stenosis. Clinical manifestations of congenital aortic stenosis in adults usually appear after the fourth decade of life. The main causes of acquired aortic stenosis include degenerative calcification and, less commonly, rheumatic heart disease. Degenerative calcific aortic stenosis (also called senile calcific aortic stenosis) involves progressive calcification of the leaflet bodies, resulting in limitation of the normal cusp opening during systole. This represents a consequence of long-standing hemodynamic stress on the valve and is currently the most frequent cause of aortic stenosis requiring aortic valve replacement. The calcification may also involve the mitral annulus or extend into the conduction system, resulting in atrioventricular or intraventricular conduction defects. In rheumatic aortic stenosis, the underlying process includes progressive fibrosis of the valve leaflets with varying degrees of commissural fusion, often with retraction of the leaflet edges and, in certain cases, calcification. As a consequence, the rheumatic valve often is regurgitant and stenotic. Coexistent mitral valve disease is common. Other, infrequent causes of aortic stenosis include obstructive vegetations, homozygous type II hypercholesterolemia, Paget disease, Fabry disease, ochronosis, and irradiation. Severe aortic stenosis is rare in infancy, occurring in 0.33% of live births, and is due to a unicuspid or bicuspid valve. Most patients with a congenitally bicuspid aortic valve who develop symptoms do not do so until middle age or later. Patients with rheumatic aortic stenosis typically present with symptoms after the sixth decade of life. Aortic sclerosis (aortic valve calcification without obstruction to blood flow, considered a precursor of calcific degenerative calcific aortic stenosis) increases in incidence with age and is present in 29% of individuals older than 65 years and in 37% of individuals older than 75 years. In elderly persons, the prevalence of aortic stenosis is between 2% and 9%. Among symptomatic patients with medically treated, moderate-to-severe aortic stenosis, mortality rates from the onset of symptoms are approximately 25% at 1 year and 50% at 2 years. More than 50% of deaths are sudden. In patients in whom the aortic valve obstruction remains unrelieved, the onset of symptoms predicts a poor outcome with medical therapy; the approximate time interval from the onset of symptoms to death is 1.5-2 years for heart failure, 3 years for syncope, and 5 years for angina. Although the obstruction tends to progress more rapidly in degenerative calcific aortic valve disease than in congenital or rheumatic disease, predicting the rate of progression in individual patients is not possible. Catheterization and echocardiographic studies suggest that, on average, the valve area declines 0.1 to 0.3 cm2 per year; the systolic pressure gradient across the valve can increase by as much as 10-15 mm Hg per year. Obstruction progresses more rapidly in elderly patients with coronary artery disease and chronic renal insufficiency. For patient education information, see the patient education article Angina Pectoris. Tintinalli JE, Kelen GD, Stapczynski JS, eds. Valvular emergencies. 6th ed. Emergency Medicine: A Comprehensive Study Guide. New York: McGraw-Hill; 2004. 54. Bergler-Klein J. Natriuretic peptides in the management of aortic stenosis. Curr Cardiol Rep. 2009 Mar. 11(2):85-93. [Medline]. Townsend CM, et al. Sabiston Textbook of Surgery. 18th ed. Saunders; 2008:1841-1844. [Guideline] Vahanian A, Alfieri O, Andreotti F, et al. Guidelines on the management of valvular heart disease (version 2012): The Joint Task Force on the Management of Valvular Heart Disease of the European Society of Cardiology (ESC) and the European Association for Cardio-Thoracic Surgery (EACTS). Eur Heart J. 2012 Oct. 33(19):2451-96. [Medline]. [Full Text]. [Guideline] Nishimura RA, Otto CM, Bonow RO, Carabello BA, Erwin JP 3rd, Guyton RA, et al. 2014 AHA/ACC Guideline for the Management of Patients With Valvular Heart Disease: executive summary: a report of the American College of Cardiology/American Heart Association Task Force on Practice Guidelines. Circulation. 2014 Jun 10. 129 (23):2440-92. [Medline]. [Full Text]. Smith JG, Luk K, Schulz CA, et al. Association of low-density lipoprotein cholesterol-related genetic variants with aortic valve calcium and incident aortic stenosis. JAMA. 2014 Nov 5. 312(17):1764-71. [Medline]. Tzemos N, Therrien J, Yip J, Thanassoulis G, Tremblay S, Jamorski MT, et al. Outcomes in adults with bicuspid aortic valves. JAMA. 2008 Sep 17. 300(11):1317-25. [Medline]. Hughes BR, Chahoud G, Mehta JL. Aortic stenosis: is it simply a degenerative process or an active atherosclerotic process?. Clin Cardiol. 2005 Mar. 28(3):111-4. [Medline]. Roberts WC, Vowels TJ, Ko JM. Comparison of interpretations of valve structure between cardiac surgeon and cardiac pathologist among adults having isolated aortic valve replacement for aortic valve stenosis (+/- aortic regurgitation). Am J Cardiol. 2009 Apr 15. 103(8):1139-45. [Medline]. Kerstjens-Frederikse WS, Du Marchie Sarvaas GJ, et al. Left ventricular outflow tract obstruction: should cardiac screening be offered to first-degree relatives?. Heart. 2011 Aug. 97(15):1228-32. [Medline]. Lancellotti P, Magne J, Donal E, et al. Clinical outcome in asymptomatic severe aortic stenosis insights from the new proposed aortic stenosis grading classification. J Am Coll Cardiol. 2012 Jan 17. 59(3):235-43. [Medline]. Jander N, Minners J, Holme I, et al. Outcome of patients with low-gradient "severe" aortic stenosis and preserved ejection fraction. Circulation. 2011 Mar 1. 123(8):887-95. [Medline]. Einarsen E, Cramariuc D, Lonnebakken MT, et al. Comparison of frequency of ischemic cardiovascular events in patients with aortic stenosis with versus without asymmetric septal hypertrophy (from the SEAS trial). Am J Cardiol. 2017 Apr 1. 119 (7):1082-7. [Medline]. Rodrigues Tda R, Sternick EB, Moreira Mda C. Epilepsy or syncope? An analysis of 55 consecutive patients with loss of consciousness, convulsions, falls, and no EEG abnormalities. Pacing Clin Electrophysiol. 2010 Jul. 33(7):804-13. [Medline]. Topol EJ, Califf RM, et al, eds. Aortic valve disease. Textbook of Cardiovascular Medicine. Section Two. 3rd ed. Philadelphia, Pa: Lippincott Williams & Wilkins; 2007:. Chap 23. Al-Najafi S, Sanchez F, Lerakis S. The crucial role of cardiac imaging in transcatheter aortic valve replacement (TAVR): pre- and post-procedural assessment. Curr Treat Options Cardiovasc Med. 2016 Dec. 18 (12):70. [Medline]. Zegdi R, Ciobotaru V, Huerre C, Allam B, Bouabdallaoui N, Berrebi A, et al. Detecting aortic valve bicuspidy in patients with severe aortic valve stenosis: high diagnostic accuracy of colour Doppler transoesophageal echocardiography. Interact Cardiovasc Thorac Surg. 2013 Jan. 16(1):16-20. [Medline]. [Full Text]. Zamorano JL, Badano LP, Bruce C, et al. EAE/ASE recommendations for the use of echocardiography in new transcatheter interventions for valvular heart disease. Eur Heart J. 2011 Sep. 32(17):2189-214. [Medline]. Piérard LA, Lancellotti P. Stress testing in valve disease. Heart. 2007 Jun. 93(6):766-72. [Medline]. [Full Text]. Messika-Zeitoun D, Aubry MC, Detaint D, Bielak LF, Peyser PA, Sheedy PF, et al. Evaluation and clinical implications of aortic valve calcification measured by electron-beam computed tomography. Circulation. 2004 Jul 20. 110(3):356-62. [Medline]. Shah RG, Novaro GM, Blandon RJ, Whiteman MS, Asher CR, Kirsch J. Aortic valve area: meta-analysis of diagnostic performance of multi-detector computed tomography for aortic valve area measurements as compared to transthoracic echocardiography. Int J Cardiovasc Imaging. 2009 Aug. 25(6):601-9. [Medline]. Bergler-Klein J, Klaar U, Heger M, Rosenhek R, Mundigler G, Gabriel H, et al. Natriuretic peptides predict symptom-free survival and postoperative outcome in severe aortic stenosis. Circulation. 2004 May 18. 109(19):2302-8. [Medline]. Ramee S, Anwaruddin S, Kumar G, et al, for the Aortic Stenosis AUC Writing Group, Interventional Section of the Leadership Council of the American College of Cardiology. The rationale for performance of coronary angiography and stenting before transcatheter aortic valve replacement: from the Interventional Section Leadership Council of the American College of Cardiology. JACC Cardiovasc Interv. 2016 Dec 12. 9 (23):2371-5. [Medline]. Brown DW, Dipilato AE, Chong EC, Gauvreau K, McElhinney DB, Colan SD, et al. Sudden unexpected death after balloon valvuloplasty for congenital aortic stenosis. J Am Coll Cardiol. 2010 Nov 30. 56(23):1939-46. [Medline]. Agarwal A, Kini AS, Attanti S, Lee PC, Ashtiani R, Steinheimer AM, et al. Results of repeat balloon valvuloplasty for treatment of aortic stenosis in patients aged 59 to 104 years. Am J Cardiol. 2005 Jan 1. 95(1):43-7. [Medline]. Rahimtoola SH. Choice of prosthetic heart valve in adults an update. J Am Coll Cardiol. 2010 Jun 1. 55(22):2413-26. [Medline]. Stassano P, Di Tommaso L, Monaco M, Iorio F, Pepino P, Spampinato N, et al. Aortic valve replacement: a prospective randomized evaluation of mechanical versus biological valves in patients ages 55 to 70 years. J Am Coll Cardiol. 2009 Nov 10. 54(20):1862-8. [Medline]. Leon MB, Smith CR, Mack M, Miller DC, Moses JW, Svensson LG, et al. Transcatheter aortic-valve implantation for aortic stenosis in patients who cannot undergo surgery. N Engl J Med. 2010 Oct 21. 363(17):1597-607. [Medline]. Smith CR, Leon MB, Mack MJ, et al. Transcatheter versus surgical aortic-valve replacement in high-risk patients. N Engl J Med. 2011 Jun 9. 364(23):2187-98. [Medline]. Daneault B, Kirtane AJ, Kodali SK, et al. Stroke associated with surgical and transcatheter treatment of aortic stenosis: a comprehensive review. J Am Coll Cardiol. 2011 Nov 15. 58(21):2143-50. [Medline]. Herrmann HC, Pibarot P, Hueter I, Gertz ZM, Stewart WJ, Kapadia S, et al. Predictors of Mortality and Outcomes of Therapy in Low-Flow Severe Aortic Stenosis: A Placement of Aortic Transcatheter Valves (PARTNER) Trial Analysis. Circulation. 2013 Jun 11. 127(23):2316-26. [Medline]. Hahn RT, Pibarot P, Stewart WJ, et al. Comparison of transcatheter and surgical aortic valve replacement in severe aortic stenosis: a longitudinal study of echocardiography parameters in cohort A of the PARTNER Trial (Placement of Aortic Transcatheter Valves). J Am Coll Cardiol. 2013 Jun 25. 61(25):2514-21. [Medline]. Mack MJ, Leon MB, Smith CR, et al. ; for the PARTNER 1 trial investigators. 5-year outcomes of transcatheter aortic valve replacement or surgical aortic valve replacement for high surgical risk patients with aortic stenosis (PARTNER 1): a randomised controlled trial. Lancet. 2015 Jun 20. 385 (9986):2477-84. [Medline]. Adams DH, Popma JJ, Reardon MJ, Yakubov SJ, Coselli JS, Deeb GM, et al. Transcatheter Aortic-Valve Replacement with a Self-Expanding Prosthesis. N Engl J Med. 2014 Mar 29. [Medline]. Wood S. CoreValve Beats High-Risk Surgery for AV Stenosis in Pivotal Trial. Medscape [serial online]. Available at http://www.medscape.com/viewarticle/822728. Accessed: April 8, 2014. Neale T. FDA OKs expanded use for CoreValve. Medpage Today. June 12, 2014. [Full Text]. Medtronic, Inc. Medtronic CoreValve System receives FDA approval for patients at high risk for surgery [press release]. June 12, 2014. Available at http://newsroom.medtronic.com/phoenix.zhtml?c=251324&p=irol-newsArticle&ID=1939539&highlight=. Accessed: June 16, 2014. Linke A, Wenaweser P, Gerckens U, et al. ; for the ADVANCE study investigators. Treatment of aortic stenosis with a self-expanding transcatheter valve: the International Multi-centre ADVANCE Study. Eur Heart J. 2014 Oct 7. 35 (38):2672-84. [Medline]. Wijeysundera HC, Qiu F, Koh M, et al. Comparison of outcomes of balloon-expandable versus self-expandable transcatheter heart valves for severe aortic stenosis. Am J Cardiol. 2017 Apr 1. 119 (7):1094-9. [Medline]. [Guideline] Chobanian AV, Bakris GL, Black HR, Cushman WC, Green LA, Izzo JL Jr, et al. The Seventh Report of the Joint National Committee on Prevention, Detection, Evaluation, and Treatment of High Blood Pressure: the JNC 7 report. JAMA. 2003 May 21. 289(19):2560-72. [Medline]. Moura LM, Ramos SF, Zamorano JL, Barros IM, Azevedo LF, Rocha-Gonçalves F, et al. Rosuvastatin affecting aortic valve endothelium to slow the progression of aortic stenosis. J Am Coll Cardiol. 2007 Feb 6. 49(5):554-61. [Medline]. Chan KL, Teo K, Dumesnil JG, Ni A, Tam J. Effect of Lipid lowering with rosuvastatin on progression of aortic stenosis: results of the aortic stenosis progression observation: measuring effects of rosuvastatin (ASTRONOMER) trial. Circulation. 2010 Jan 19. 121(2):306-14. [Medline]. Cowell SJ, Newby DE, Prescott RJ, et al. A randomized trial of intensive lipid-lowering therapy in calcific aortic stenosis. N Engl J Med. 2005 Jun 9. 352(23):2389-97. [Medline]. Eltchaninoff H, Prat A, Gilard M et al,. Transcatheter aortic valve implantation: early results of the FRANCE (FRench Aortic National CoreValve and Edwards) registry. Eur Heart Jl. 2011. 32:191–197. Wood S. New valve guidelines offer staging, risk-scoring advice. Medscape Medical News. March 5, 2014. [Full Text]. [Guideline] January CT, Wann LS, Alpert JS, Calkins H, Cigarroa JE, Cleveland JC Jr, et al. 2014 AHA/ACC/HRS guideline for the management of patients with atrial fibrillation: executive summary: a report of the American College of Cardiology/American Heart Association Task Force on practice guidelines and the Heart Rhythm Society. Circulation. 2014 Dec 2. 130 (23):2071-104. [Medline]. [Full Text]. Bagur R, Webb JG, Nietlispach F, Dumont E, De Larochellière R, Doyle D, et al. Acute kidney injury following transcatheter aortic valve implantation: predictive factors, prognostic value, and comparison with surgical aortic valve replacement. Eur Heart J. 2010 Apr. 31(7):865-74. [Medline]. [Full Text]. FDA approval expands access to artificial heart valve for inoperable patients [press release]. Food and Drug Administration. September 23, 2013. Available at http://www.fda.gov/NewsEvents/Newsroom/PressAnnouncements/ucm369510.htm. Lefevre T, Kappetein AP, Wolner E, et al. One year follow-up of the multi-centre European PARTNER transcatheter heart valve study. Eur Heart Jl. 2011. 32:148–157. Leon MB, Smith CR, Mack M, et al. Transcatheter aortic-valve implantation for aortic stenosis in patients who cannot undergo surgery. N Engl J Med. 2010 Oct 21. 363(17):1597-607. [Medline]. Prasad Y, Bhalodkar NC. Aortic sclerosis--a marker of coronary atherosclerosis. Clin Cardiol. 2004 Dec. 27(12):671-3. [Medline]. Rosenhek R, Zilberszac R, Schemper M, Czerny M, Mundigler G, Graf S, et al. Natural history of very severe aortic stenosis. Circulation. 2010 Jan 5. 121(1):151-6. [Medline]. Tamburino C, Capodanno D, Ramondo A, Petronio AS, Ettori F, Santoro G, et al. Incidence and predictors of early and late mortality after transcatheter aortic valve implantation in 663 patients with severe aortic stenosis. Circulation. 2011 Jan 25. 123(3):299-308. [Medline]. Wood S. Expanded FDA indication for Sapien valve. Medscape Medical News. September 24, 2013. [Full Text]. Zahn R, Gerckens U, EGrube E et al. Transcatheter aortic valve implantation: first results from a multi-centre real-world registry. Eur Heart Jl. 2011. 32:198–204. Zajarias A, Cribier AG. Outcomes and safety of percutaneous aortic valve replacement. J Am Coll Cardiol. 2009 May 19. 53(20):1829-36. [Medline]. [Guideline] Svensson LG, Adams DH, Bonow RO, et al. Aortic valve and ascending aorta guidelines for management and quality measures. Ann Thorac Surg. 2013 Jun. 95 (6 Suppl):S1-66. [Medline]. [Full Text]. Frank RD, Lanzmich R, Haager PK, Budde U. Severe aortic valve stenosis. Clin Appl Thromb Hemost. 2017 Apr. 23 (3):229-34. [Medline].